The Peltier effect is named after Jean Charles Athanase Peltier who discovered it by accident while investigating electricity. In the eventful experiment, Peltier joined a copper and a bismuth wires together and connected them to each other, then to a battery. When he switched the battery on, one of the junctions of the two wires got hot, while the other junction got cold. The Peltier effect is the heat exchange that results when electricity is passed across a junction of two conductors, and is a close relative of the Seebeck effect (effectively the same phenomenon in reverse, used in thermocouples used to measure temperature), and the Thomson effect (generation of electricity along a conductor with a temperature gradient). Sparing ourselves the maths, conduction electrons have different energies in different materials, and so when they are forced to move from one conductor to another, they either gain or lose energy. This difference is either released as heat, or absorbed from the surroundings. 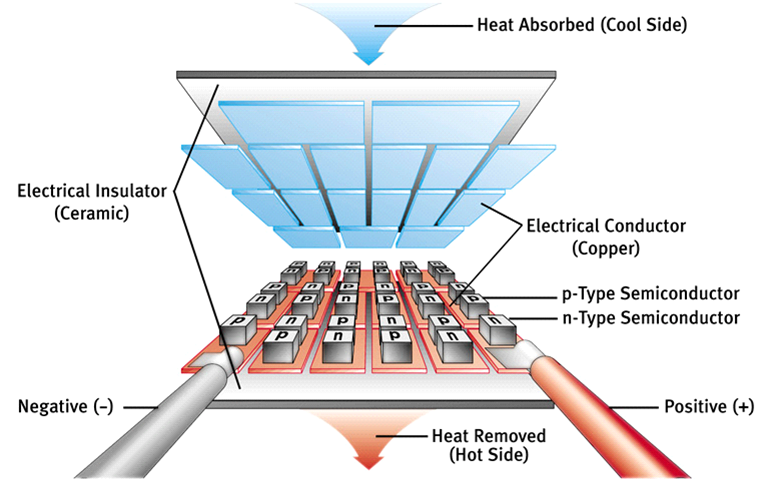 When two conductors are arranged in a circuit, they form a heat pump, able to move heat from one junction to the other. Unfortunately, though, it’s not always this simple, as the Peltier effect is always up against the Joule effect – the ‘frictional’ heating that results from electrons bouncing off the atoms. In most systems, this swamps the Peltier effect, and means that all that you get is a bit more heating at one junction, and a bit less heating at the other. Nonetheless, the Peltier effect has a lot of technological potential. It is very reliable, and since it has no moving parts, it rarely needs maintenance while being mobile. Reblogged this on Renew Niagara's Energy.